Happy New Year! 2017 has just appeared out of nowhere, however I'm really looking forward to a whole new year and seeing what it brings! Firstly, I just wanted to address my absence from the blogosphere... For the past few months, since starting a new job (2016 ultimate goal achieved? Big fat tick! ), I honestly have struggled to find the time to sit down and get loads of new blog content out. But not only that, I just haven't been feeling blogging. I've stopped reading blogs pretty much and the thought of even looking at my blog or checking out GA filled me with complete dread! However after a good break, I feel happy to be back with a clear head and lots of new ideas. Lets make this the year She's So Lucy actually makes it a whole year of non stop blogging, ok? Yes, after the month or so of non stop prosecco popping and indulgence, it's a wise idea to get back on a path of healthier eating and moving our bodies a little more. I don't know about you but I could happily munch on a plate of raw veggies and green smoothies galore right now - my body is just craving nutrients! However, there's nothing worse than being bombarded with endless celeb workout DVDs, healthy cookbooks, and every other post online promising to give you the ultimate trick to shedding the festive flab. January Detox? Nah, you're alright thanks! Instead, I've whipped together this tasty low carb granola recipe that feels and tastes much more indulgent than it really is. I've used Madeleine Shaw's Grain-free Chocolate Granola recipe from her first book, Get The Glow as a base recipe and adapted it to a new flavour. 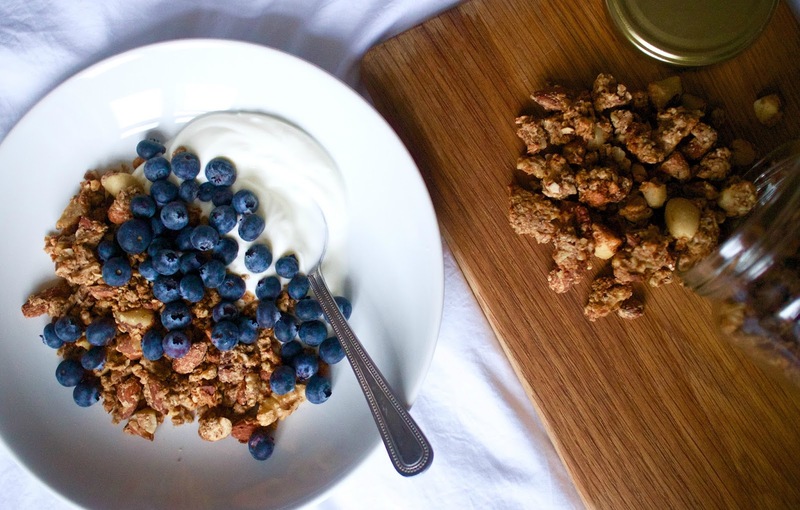 Seriously, there's no point buying overpriced packets of granola from the supermarket when it's so easy and quick to make! This low carb peanut butter granola is packed full of protein to keep you full, and an assortment of nuts to keep your hair, skin and nails healthy and to also leave you feeling full. I have added a scoop or two of rolled oats to add just some carbs to this recipe - whilst my body prefers a lower carb diet, it doesn't mean no carbs! This is naturally sweetened with a ripe banana and a pinch of cinnamon - no syrups or bagged sugar in sight! 1. Preheat the oven to 180c electric/160c fan. 3. Blend the banana, peanut butter, coconut oil, cinnamon and big fat pinch of salt in the food processor until it forms a smooth paste. If you're using a traditional peanut butter, add 1/2 tsp extra of coconut oil if it's looking a little too thick. 4. Pour your paste on top of your nut and oat mix and mix well together until everything is well combined. Spread onto a large baking sheet that has been lined with baking paper. Break up the mixture into small clusters. 5. Pop in the oven for 20 minutes. After 10 minutes give it all a good stir and break up more if needed. Then check every 5 minutes and be careful none of the mixture catches or burns. 6. Store in an airtight container - it should last for 1-2 weeks, if you can make it last that long! TIP: Serve with warm almond milk or whipped Greek yoghurt and fresh berries. Or, sprinkle over a smoothie bowl or even enjoy a small handful as a snack.